On behalf of the University of Canterbury Library we wish to thank all those organisations and people who generously assisted with the Armson Collins Digitisation Project. Special acknowledgment is due to the donors of the Armson Collins collection, Maurice Hunt and Darryl Partridge, and to Ian Lochhead for his role in the development of the architectural drawings collection at the University. We would also like to thank Steve Weaver, AVC Research at UC for providing financial backing for the project. Very special thanks go to Terri Elder for her exhaustive research, dedication and creativity. Without the foresight, support and commitment of these people, this project would not have been achievable. Not quite the project team. 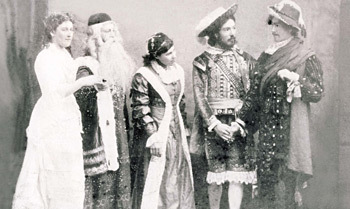 This is the cast from the Canterbury College production of Much Ado About Nothing c.1890.